U.S. President Obama and Russian President Dmitry Medvedev announced Wednesday that their countries will soon begin negotiations on reducing their nuclear arsenals, according to a joint statement from the two leaders. 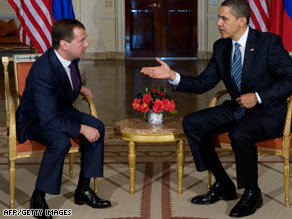 The announcement came after Obama and Medvedev met in London ahead of Thursday’s G-20 summit. The statement said the two leaders agreed that the Strategic Arms Reduction Treaty on the Reduction and Limitation of Strategic Offensive Arms — which expires in December — “has completely fulfilled its intended purpose and that the maximum levels for strategic offensive arms recorded in the treaty were reached long ago.” “They have therefore decided to move further along the path of reducing and limiting strategic offensive arms in accordance with U.S. and Russian obligations under Article VI of the Treaty on the Non-Proliferation of Nuclear Weapons,” the joint statement said. Negotiators from both countries will soon begin talks “to work out a new, comprehensive, legally binding agreement on reducing and limiting strategic offensive arms to replace the START Treaty,” the statement said. Earlier, two senior Obama administration officials said another goal of the president’s meeting with Medvedev was to set a date for a U.S.-Russian summit in Moscow, Russia, this summer. The joint statement said negotiators from both countries would report their progress on working out the new nuclear arsenal reduction agreement by July. The two agreed to set up a high-level strategic and economic dialogue chaired by Cabinet-level representatives — Secretary of State Hillary Clinton and Secretary of the Treasury Timothy Geithner for the United States, and State Councilor Dai Bingguo and Vice Premier Wang Qishan for China. Obama and Hu appear to have deferred the question of human rights, one of the greatest points of friction between the two sides. “The two sides agreed to resume the human rights dialogue as soon as possible,” the White House statement said. China did not immediately confirm the details of the U.S. announcement.